“Where does the money go?” is a question we unfortunately hear all too soon when discussing budgeting and cash flow. Often the only thing simple about a family’s cash flow is that it is simply confusing. As we wrap up our Cash Flow discussions in the Ballast Atheneum, today we’ll lay out how we help simplify complicated family finances into one key number. Often times we see clients paying bills out of multiple checking or savings accounts, using several credit and/or debit cards for living expenses, or with a job that has an uneven income. We also see couples where one spouse’s income is deposited into one account, and the other spouse’s into a different account, and then bills are paid from both. Any of these types of situations can lead to a hodgepodge of ins and outs in terms of cash flows, making the budget picture more confusing than is necessary. What follows is an example of a client with an uneven income, but this general strategy can be tailored for any of the aforementioned situations. Let’s take the hypothetical situation of a client who is in sales – it could also be a solo attorney with fluctuating billable hours each month, or a small business owner who needs to see the picture of the whole quarter before determining their draw. Assume their annual income (after tax) is right under $100,000, but it’s not paid as $8,000/month. Rather, it’s a base salary of $3,000/month with performance bonuses at the end of each quarter. The “issue” here is that in any given month, the client’s bank account can range from close to zero to around $20,000, which can make creating – and sticking with – a budget more difficult than with an “even” salary. 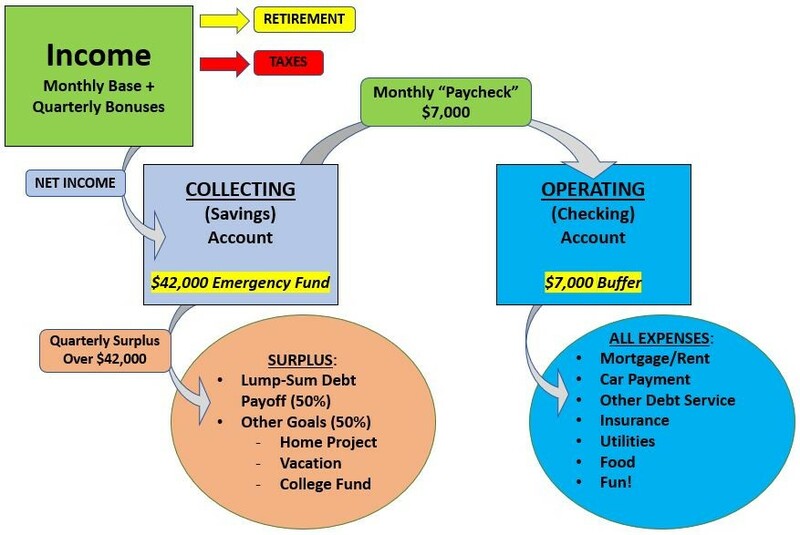 One potential solution is opening a “collecting” (savings) account and an “operating” (checking) account. In general terms, all income is deposited into the collecting account – this includes both the monthly paychecks and the quarterly bonuses. The operating account starts with a buffer amount to prevent overdrawing and receives a monthly “paycheck” to pay all bills and expenses. In this example, let’s assume the client’s monthly expenses average $7,000, so the monthly transfer from the collecting account to the operating account is set at that number. In essence, this creates an even monthly “paycheck” for the client to budget around. For a single income earner, we would recommend an emergency fund equal to six-months of expenses, in this case $42,000. Finally, we’d recommend the operating account buffer to be about one-month worth of expenses, so another $7,000. Note: it may take a few months to get the emergency fund and buffer amount where you want them, we’re not assuming it will be done on day-one. The excess funds (above the $42,000 emergency fund) in the collecting account can be earmarked for goals. Let’s assume the client in our example decides to use 50% of the surplus each quarter to make a lump-sum payment toward outstanding debts (mortgage, car, student loans, etc.) and the other 50% toward various other goals such as a home project, a vacation, or a college fund for their youngster. For all of the visual learners out there (myself included), the following chart might make this strategy easier to understand. This strategy has several benefits. First, it simplifies the budgeting process to monitoring one key number. During the month, the client only needs to track the balance in the operating account and seek to keep it above the buffer amount (here, $7,000). Savings happens automatically in the collecting account, and as savings grow they can periodically be put to use to fund predetermined goals. In this case, the client can put any surplus savings (above $42,000) towards goals at the end of each quarter. A second benefit here is that the surplus is already spoken for. This helps reduce the tendency for lifestyle inflation (i.e., spending more in bonus months). Having the remaining funds pooled into a segregated collecting account increases the likelihood that they will be used to fund those predetermined goals, rather than being spent on unplanned splurges. You won’t feel like you got whacked when you write a lump-sum check to pay down debt or feel guilty when you book that vacation – you’ve already planned to do both. Finally, by having the income deposited to the collecting account with only the operating expenses transferred out each month, you are much more likely to be successful in your savings goals. Those who try to save by hoping to have money left over at the end of the month are generally less successful than those who pull the savings out off the top and never even let it touch their spending accounts in the first place. This is a general example, but this strategy can be tailored to fit a multitude of situations. Even though it’s a simple change to make, it has provided powerful results that vastly improve a family’s financial future. If this sounds like something that might be helpful to you, please give us a call and we’d be happy to talk through your personalized strategy.